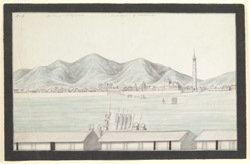 The image shows the Dharahara tower ('Bhimasen's Folly'), in the distance on the right. Built in 1832 by Bhimsen Thapa the Prime Minister, the Dharahara served as a watchtower. Once open to the public, the top of the tower has a good view of the Valley. Newar temples, European-style mansions, and the hills beyond can also be seen in this view. A group of sepoys stand in the foreground wearing the turban-ornaments (star and moon) to which the inscription refers.